Enjoy 25% off select bedding and bath items at Neiman Marcus through Friday! Pick up luxurious bedding basics like these 1,020 thread count sheets, a cozy cashmere throw, or this gorgeous duvet cover. For the bathroom, I suggest this French script shower curtain, this shagreen vanity accessories set, and these classic bath towels. You also must snag a couple of these colorful Trina Turk towels for your next beach trip! Click here to shop the sale. Clearance is now on at NET-A-PORTER, which means there are only a few days left to shop the sale! A few last knockouts to mention: this black rockstud clutch, these Givenchy sandals, and this Eugenia Kim floppy felt hat. Also, be sure to stock up on beachwear for this spring/summer – so much good stuff! Yesterday I received a last-minute invite to the BCS National Championship game (Ohio State vs Oregon) in Dallas, so I didn’t get home until 1:30am! Needless to say I’m exhausted and am keeping today’s post short and sweet. Hope you all have a wonderful Tuesday! Lovee #3 and #7, great picks! I love the look of a denim pencil skirt but I feel like I look SO short wearing them! That top and that lamp, so beautiful! Amazing bag! I didn’t know what I was missing in my life. Love everything, especially number 1 and 2. Great picks! So many goodies! I’ll takes numbers 4, 9 and 13 please!! Love those heels – killer! I’m all about the ripped distressed denim skirt. I’m thinking I need another one from AG Jeans and debating one I saw on sale! 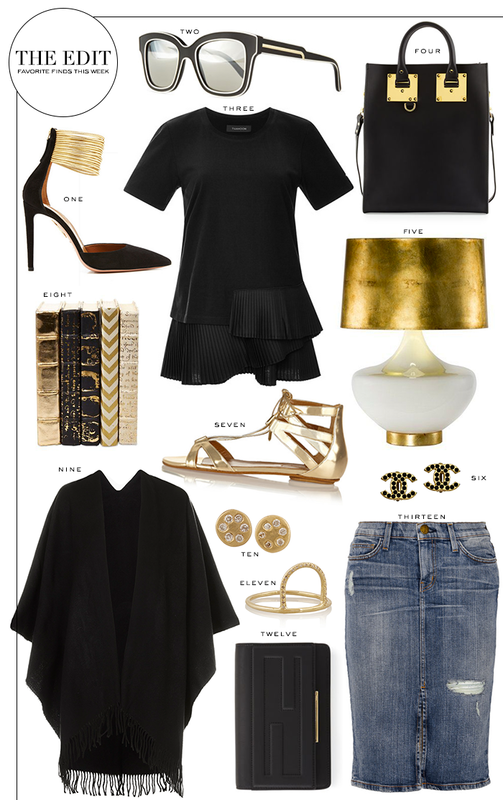 I am obsessed with all things black and gold. Love them all! My two fave colors…black and gold!! Love the heels!